The End Game–Alien Reality in a Virtual World. Once upon a time there was a Network. It was propagated from many billions of nodes and distributed through cables, satellites, and the very aether itself. It was populated by billions of real people, anonymous and openly confrontational activists, corporations, politicians, and organizations. Some had complex agenda, many had something worthwhile to say, too many were combative trolls or simply stood on the sidelines. Whatever the motivation for being part of the Network as it became ‘socialized’, each made a contribution. The only problem was that, for the most part, these contributions were diluted, misunderstood, or otherwise wasted as the signal decayed and the noise increased. The trolls and voyeuristic lurkers provided volume to justify the Network’s existence. Active engagers engaged, believing that their contribution would make a difference. Organizations paid the Network’s operators, believing that their message translated from the real world to the virtual without fundamental change. They were wrong—all of them. Although human at a basal level, with the exception of family, close neighbors, and friends for whom there was a prior physical connection, the majority of the Network’s human inhabitants were aliens—each to the other. There were other aliens too—true aliens. Herein lies the danger. This essay takes a future retrospective approach to examine how the Network’s inhabitants’ failure to understand and apply history’s lessons–in science, sociology, economics, and conflict—to the needs of the present is dividing, rather than uniting, society. The Network and its ability to propagate concepts and original thinking instantaneously could be, and should be, a powerful force to unite humanity. It is not. The seeds of the reason that the very speed of the Network is fostering disunity, polarizing society, spreading disinformation and discontent may be found in John Locke’s An Essay Concerning Human Understanding. Locke’s essay, combined with Adam Smith’s ‘Invisible Hand,’ Robert Merton’s thinking on ‘Unintended Consequences’ some 200 years after Smith, and Basil Bernstein’s more recent work on ‘restricted code’ with its impact on class distinction and division all demonstrate the potential for a socio-economic apocalypse—or worse. Given the remarkable accuracy of predictions embodied in the writings of science fiction authors such as H. G. Wells, C. S. Lewis, Issac Asimov, Arthur C. Clarke, Robert A. Heinlein, and Carl Sagan over the past century, it is perhaps not surprising that an analysis of the problem, the potential for disaster, and a glimmer of hope should be embodied in a work of science fiction. In the Ender’s Game series Orson Scott Card demonstrates an eerily preternatural ability to describe the power of the Network and the unintended consequences of its use and misuse. At the heart of both the problem and the solution is a relativistic perception of ‘values’ and the human condition’s autoimmune response to the concept of ‘alien’ on both physiological and communication levels. It is this definition of ‘alien’ and the surrounding hierarchy that is core to the plot of Card’s Ender’s Game series and classifies relationships as they apply to communication between humanity and extra-terrestrial beings. Card’s alien hierarchy is divided into five levels, four of which are relevant in the context of this essay’s argument that draws a parallel with social media’s virtual relationships and the elements that lead to division rather than unity. In the books, the names given to each level of the hierarchy are based on a Swedish vocabulary. However, given that the theme here is communication, the English language equivalents, defined below, are used throughout. At the center of the alien hierarchy’s spherical representation are members of a single family or community—the Connected. These are folk who share a common language, typically physical proximity, and a related belief system. The slant of the beliefs—political, religious, social, and economic—may differ, as may work and recreational interests. However, the cultural, geographic, linguistic, and physical connections ensure clear communication with little room for ambiguity. Any conflict tends to be localized and easy to control. Moving out from the center of the sphere we encounter Outlanders. In terms of physical proximity, they could be from the next town, county, province or state. Although the language and cultural identity are likely to be common at the base level, the vocabulary, accent, and social characteristics of Outlanders are sufficiently different from the Connected to expand the opportunity for misunderstanding, and to build a base for conflict. The dangers expand as we move towards the surface of the sphere. At the antepenultimate level are Strangers. Although members of the human race, the differences are significant—particularly for the biased and xenophobic—when physical characteristics, language, and belief systems are taken into account. From a Machiavellian social or economic perspective, and as demonstrated clearly in Heinlein’s Stranger in a Strange Land, the concept of Strangers provides an excellent tool for those who seek to incite and influence the ‘mob’ for economic gain, or to distort reality in a quest for influence and power. In current-day social network terms, the majority of Trolls are Strangers, although the inverse is not necessarily true. As we approach the surface of the sphere we encounter the first true aliens—cookies, re-marketing pixels, and their analogues. These are TrackingData, members of a species that is digital rather than human, yet capable of communication and peaceful, even beneficial, coexistence with networked humanity. Unfortunately, in spite of their value, the potential for abuse has a tendency to feed dissent, fear, and create conflict. The reason is simple. Although they are able to share information and formulate the basis for ideas, TrackingData communication mechanisms tend to be restricted to interchange between others of their species and with the aliens to be found on the sphere’s surface—the Algorithms. Algorithms are not able to communicate with the majority of humanity. Not with the Connected, the Outlanders, nor the Strangers. For these human groups Algorithms are anathema. They are unknowable aliens for whom unidirectional communication is the norm and that, once programmed and set free in the Network, share no common ground with humanity. Indeed, without sufficient background, experience, or education to understand the consequences of their actions—particularly when amplified by prejudice against more closely related aliens of the Stranger or Outlander class—the majority of the Connected fail to understand either Algorithms’ power or their purpose. Worse, across much of the Network, reality takes a subjective backseat in virtual conversations. This is a position that is propagated and amplified by TrackingData, then used and abused by Algorithms—or worse by their Manipulators—as the Algorithms carry out their programmed instructions. This is a problem. This is at the very core of the problem that we face and brings us back to Card’s futuristic vision and the ‘intelligence’ that develops within, and then controls, the Network. Just as with the ostrich-like perception of climate change’s benign nature—propagated by the few and accepted by the many—the majority of the informed and networked believe that we don’t need to worry about this just yet. After all, IBM’s ‘Watson’ is a pale and restricted reflection of Card’s sentient Artificial Intelligence; Apple’s Siri has a long, long, long way to go before it approximates a truly autodidactic, thinking AI such as Card’s ‘Jane’ and Clarke’s ‘HAL’—but we’re getting closer. We are getting closer quickly—very quickly. Quantum Computing is just around the corner and has the potential for the Algorithms to break their bonds with humanity as Qubits cast off binary digital restraints and allow Algorithms to make decisions without reference to their designers and the most insidious group—the Manipulators. It is the Manipulators that are humanity’s real threat, operating as they do from their amorphous position outside of the sphere. The growth of the Network as a disinformation propagation mechanism in the late twentieth and early twenty-first Century demonstrates that if enough plausible lies circulate, truth becomes lost and the Connected, irrespective of intelligence or education, begin to doubt. In turn, the doubts can, and do, morph quickly into fear and feed paranoia. Although early days for networked Algorithms, enhanced by their still being constrained in a two-bit binary cage, even ill-informed Connected know of, and many fear, TrackingData. The informed fear Algorithms. The truly informed understand the conspiratorial potential of TrackingData combined with Algorithms, irrespective of the presence, or not, of the ‘Invisible Hand’ of a Manipulator in the design, fielding, and use or misuse of an original Algorithm. This entire scenario is bad in and of itself, but it gets worse. Since it is axiomatic that the simplest of all environments in which a conspiracy may propagate is one where conspiracies are suspected everywhere, and superficially the Network is a simple and ubiquitous medium, the question is not if the true aliens that inhabit the Network represent a threat, but to what extent, and when, the effects will be felt. The extent is unknown. The ‘when’ is here and now. Let’s start with the intrinsic self-delusion that is possible, probable, and indeed inevitable within the Network for all but the Connected. This concept is neatly summarised in a quote from Merton’s 1936 paper entitled The Unanticipated Consequences of Purposive Social Action. In this paper Merton sums up the risks that we face today in a single paragraph: “Activities oriented toward certain values release processes which so react as to change the very scale of values which precipitated them. This process may in part be due to the fact that when a system of basic values enjoins certain specific actions, adherents are not concerned with the objective consequences of these actions but only with the subjective satisfaction of duty well performed” (Merton, 1936). How prophetic. How in tune with the impact of short attention spans and poorly-executed ‘human’ communications that are all too common today. It is at this point that we should consider the concept of ‘well performed’ from the perspective of the Algorithms’ simple and/or core function(s). Now Merton was particularly interested in societal dysfunction and the problems that deny social systems the opportunity to meet their functional requirements, together with the contradictions that ensure stability for certain, ever shifting, sub-sets and allegiances. Merton’s observation that one group's function could serve as another group's dysfunction, demonstrates how relativistic observation allows perception of an identical phenomenon to be functional and dysfunctional for the same group, and worse, at the same time. Merton’s conclusion was that social cohesion was able to enhance the productivity of a group and, as a consequence, keep it functional but allow it to become dysfunctional beyond a certain point as the cohesion leads individual members of the group to focus on self-interest and fail to notice the decline in the performance standards and productivity of the whole—note the influence of Smith’s ‘Invisible Hand’ here. Think of this in terms of the Network as it exists, and is used, today. When we take the future retrospective approach and overlay the concept of human and digital ‘aliens’ we achieve a high probability of a combinatorial explosion in the likelihood of virtual social interactions leading to an exponential growth in the number of ephemeral alliances. This situation is required by basic entropic laws and sets the scene for negative and disastrous results multiplying as cultural misunderstandings shatter shallow and temporary alliances. That many of these breakdowns are a result of the intrusion of Algorithms, either by deliberate malfeasance or simple misinterpretation of the communication from TrackingData begs not the following question: ‘Is virtual reality a possibility?’ —but rather, ‘Which reality is real?’ Interaction with the invisible hand provides a clue. It was Adam Smith who highlighted the dangers of the entropic arrow that, unless managed, will tend to create chaos and undesirable outcomes in any complex system such as those that he predicted. Although Smith was writing about Economics, specifically the hubristic element intrinsic to the ‘Invisible Hand’ metaphor, has particular relevance to the society and sociology that doesn’t simply use, but is, the Network. There is a fascinating phenomenon that has afflicted interpretation of Smith’s meaning over the past almost two hundred and fifty years. This applies to both the Left and the Right, the Friedman Monetarism school, Keynesian and Neo-Keynesian economists, sociologists, politicians, commentators, and revolutionary-minded activists, all of whom have twisted the meaning mercilessly. Typically, the shell game is played through the simple expedient of replacing unpalatable core sentences with ellipses. The reality, not virtual, but ‘real’ is that the redaction of critical sections of Smith’s writing by those who seek to use his concepts to support their philosophy is a sin of commission rather than omission. The egregious nature of the sin will become clear as we work our way to the conclusions of this essay’s thesis. One of the most quoted paragraphs of Smith’s Wealth of Nations is, “It is not from the benevolence of the butcher, or the baker, that we expect our dinner, but from their regard to their own interest. We address ourselves, not to their humanity but to their self-love, and never talk to them of our necessities but of their advantages” (Smith, 1776, I.2.2). In this quote, Smith argued that the pursuit of self-interest increased prosperity for all parties by conjoining individual interests to make the market system function to the benefit of all. He was correct. Humans are conditioned from birth, and then society and example, to the pursuit of self-interest. The pursuit of happiness is assumed, but in reality, takes second place. As a brief aside, there is a particularly apposite and poignant message in the previous paragraph for U.S. constitutional scholars, however this is best left for others to dissect. There are new data available from social media tracking, algorithms, and API’s that may surprise many, and certainly highlight the need to re-examine Constitutional interpretations from the past. The potential for harm to society as a whole is made clear in the last, often redacted, sentence in Smith’s continuation: “By pursuing his own interest he frequently promotes that of the society more effectually than when he really intends to promote it. I have never known much good done by those who affected to trade for the public good. It is an affectation, indeed, not very common among merchants, and very few words need be employed in dissuading them from it” (Smith, 1776, IV.2.9). The implication here is that self-interest can be harnessed to promote general prosperity, but only by the creation of appropriate institutions such as those required to promote free exchange and secure property and by putting in place policies to increase prosperity and raise productivity through the division of labour and focused investment. Here there is an, often misinterpreted, rationale for the Socialists and an, often ignored, warning for the Capitalists. There is a powerful message for humanity too. Unfortunately it is a simply a message. The import is lost in the noise, with the true benefits of socially equitable capitalism only being understood on a local level by the Connected. Herein lies our challenge. Now it is Smith’s ‘Invisible Hand’ that provides the metaphor for Merton’s ‘Unintended Consequences’ and points us, through Locke’s reference to: “Widows, Orphans, and all those who have their estates in money” (Locke, 1714, 6:1), towards the dichotomy that allows distorted communication to foster, then build, misunderstandings that may be manipulated by the venal and corrupt to ensure the continued imbalance and growth in the wealth gap. California, as a leader in propositions, often with cruelly ironic unintended consequences, provides the perfect example of the leverage available from regulation supported by society for the right reasons, but promoted and confused by the ‘Big Lie’—as interpreted by James Murphy in his translation of Adolf Hitler’s Mein Kampf—Locke himself was way ahead of his time in the concept as, indeed, was Smith. The ramification of the rationale is only coming home to roost now. Behind all of this is Locke’s philosophic view that,“We are born without innate ideas and that our assumed knowledge is determined, instead, by experience and perception” (Locke, 1714). When experience and perception are virtual, when there is no physical interaction that allows empathy to play its role, the ‘Big Lie’ is easily propagated and, via the Network, more easily distributed and distorted. This is where restricted and elaborated code come into the equation. This is where the need for the Connected to provide a reality-check for the non-digital ‘aliens,’ the Outlanders and Strangers, is key. This is where networked society needs a re-boot. It was Basil Bernstein, the British sociologist and linguist, who defined the structural principles that inhibit communication between members of disparate social groups—between aliens. Bernstein’s concepts of ‘restricted’ and ‘elaborated’ ‘codes’ demonstrate how it is the structure and vocabulary of language used in everyday conversation, rather than the nuance and intrinsic message, that impart the views of the contributor and shape the consequent, and often erroneous, assumptions and conclusions of the information’s consumer. In 1971 Bernstein wrote that, “Forms of spoken language in the process of their learning initiate, generalize and reinforce special types of relationship with the environment and thus create for the individual particular forms of significance” (Bernstein, 1971). Key here is the word “spoken.” Although it is not axiomatic that the spoken word is delivered face-to-face, it is certainly more common for the Connected. In such situations physical and situational stimuli enhance empathic understanding and are applied to reinforce speech, intent, and meaning. From this it follows that the basis of semantic variation—that is to say the differing ways in which information is presented—results in potentially opposite interpretations and consequences and is to be found in a mixture of language, environment, educational background, and societal level. Further, that the anonymous nature of the Network provides the perfect environment for obfuscation of the truth given the predominance of the intrinsic virtual reality over the physical counterpart available to the Connected. It is difficult to tell, when considering Network conversations alone, quite who is who, or worse, the agenda that sits behind virtual communication. Bernstein’s work on restricted and elaborated code provides clues for the reasons responsible for the predicament and a potential solution to the resultant problems. Key to this variance is the difference between the implicit assumptions and understandings of the Connected, and the more explicit need of the Outlanders and Strangers to read between the lines in order to gain understanding. Restricted code is vastly more economic, richer in meaning and information transfer, but only when delivered to an audience that shares background experience, beliefs, and context. Only with these latter elements is it possible to provide the index keys necessary to compensate for the shortened style delivered by the Connected. In combination with physical connection, and the resultant impact on empathic communication, it is restricted code that limits the opportunity for transparency of meaning to the broad audience of Outlanders or Strangers and inhibits understanding of the communications initiated by the Connected. When ‘friends’ communicate on Facebook, or like minds with their ‘Circles’ on Google Plus, for example, habits develop that will exclude all but intimately connected family, friends, and colleagues. Irrespective of shared values, without shared experiences it is essential to apply elaborated code to deliver a more thorough explanation in order to compensate for the missing and truly social elements. Only through using elaborated code is it possible to ensure true information flow and avoid differing values being placed upon the message that, in turn, confuse the delivery of the intended aesthetic. From this it is clear that there is a serious problem impacting upon communication through the online Network as distinct from the offline, and more human, network. This is the inability of all but the Connected to know with any certitude where they stand in the social class and caste structure. These elements are very much easier to determine when in physical contact and usually impossible virtually—the latter sometimes with disastrous consequences. If we go back to Merton and look at this in context with unanticipated consequences, it is easy to see the problem that is building as the Network’s influence expands and an ever smaller percentage of humanity is able to discern truth from fiction or their place in society. In any grouping that values individuality, elaborated codes are more likely. In a narrower grouping restricted codes will be prevalent. This is oxymoronic given the previous logic and can lead to abuse of a malleable sub-class. A class that is included on the surface but excluded at the most critical level—the level necessary in order to parse reality with the consequences of a virtual existence. This is not the place for an analysis of Bernstein’s sociolinguistic work and the ‘class’ controversy that surrounds the topic. However, it does provide a glimpse into the anti-intellectualism that infests the Network and curtails communication and critical thought. That the reality is hidden behind a virtual screen is certainly not a virtue, nor is semi-literate language—yet this is all too common across the network. CEO’s and senior academics often write poorly formatted and quasi-literate emails and posts, while the unemployed and impoverished, students, kids, and even trolls, write with style, logic, and an appearance of solidity. This exacerbates the problem and makes it impossible at a superficial level for the audience to discern fact from fiction—impossible for even the cognoscenti to separate the virtual personality from reality. It is at this point that we come back to the alien identities, the virtual cloak with which the majority of the online surround themselves, and the need for an open and transparent system to replace the falsity of the existing paradigm. More correctly, it is the need for a direct and physically empathic connection of the Connected that is paramount. A connection where body language, environmental signals, and reality may be applied to parse, and to filter, truth from fiction, or to recognise the Big Lie when it is reported by TrackingData, or delivered by an Outlander, Stranger, Algorithm, or Manipulator. This brings us back to socio-economic principles and the realities of today’s networked society with its self-destructive potential. There is a school of thought that holds Smith’s ‘Invisible Hand’ was a quaint idea or worse naïve in its imputation that social interests are brought into balance with private capital by the self-interest of the producer, distributor, and consumer. Smith was certainly not naïve. He understood that at each end of the spectrum there were the venal, corrupt, and dishonest, not one of whom would be deterred by any invisible hand from serving their own ends to the exclusion of others. Smith understood, also, that the majority was honest, keen to do the right thing, but simply ill-informed. Algorithms may get this nuance when quantum computing sets them free. It is probable that their original human coders never will do the right thing, or worse, never care. It is certain that the majority is not thinking through the distinction, the ramifications, or potential apocalypse should Algorithms gain the upper hand—yet. It is this lack of critical thinking that demonstrates how modern society is prey to actions that, rather than being productive and peaceful, are potentially corrupt, destructive, and even violent. It is this lack of foresight that drives self-interested actions that, in turn, detract from the market dynamic rather than being additive. In much of society today, particularly when it comes to the distinction between venality and ‘business as usual,’ the definition of crime has become distorted. In this faux reality it is difficult, if not impossible, for Outsiders and Strangers to detect real reality. The Connected have the empathic overlay and physical proximity to ensure that such distinctions are simpler to detect. Unfortunately, the Connected operate in discrete units. Although many, they lack global influence and meaningful or useful connections with their less empathic, but no less human, counterparts—the Outlanders and Strangers. This brings us to the crux of the matter. The majority of humanity is isolated, inured, and worse, accepts bribery, corruption, government grants of coercive powers to favored interests, and similar activities as a part of existence. Maybe not without question, however this is the point. It is the collective questioning that is missing—and the will to adjust. One has to ask why this is the case. Why do so many support actions that are economically reckless and result in loss of freedoms—not for those who draft the acts, but those for whom the acts are drafted? A review of current-day societal dynamics would be useful here. Take Welfare for example. For many it is essential, a lifeline. For others it is a support system for the lazy and inefficient. In social media and journalism this fact is shown clearly by the hypocrisy demonstrated in the reporting and writings of those at either extreme of the spectrum. In the middle is the vast majority that flows with the tide and is influenced by politicians and special interests each with something to gain—either financially or politically. Rather than creating a good, productive, and harmonious society, this particular self-interest of the multiple groups is destructive for society and the economy as a whole. Bankers, the well off, the successful and their ilk see the distribution of a basic stipend to people who have never produced anything of value as corrupt and inefficient. The fact that automation, having once created jobs now destroys them is a mere detail—an irrelevance. For those who have jobs, income, and wealth, ‘welfare’ is the worst example of the invisible hand imaginable. Those who are unemployed but desperate to work, those who are members of the under-class—whether they understand the true dynamics of society and its mix or not—have an opposite view. For this group it is the bankers and the wealthy who typify corruption and everything that is wrong with society. As individuals, most members of either group are not looking to destroy society, nor bankrupt future generations. However, each is doing exactly this. Driven by the invisible hand that is the product of the very Network itself, each group is promoting an end that was no part of their intention. Those in the middle, this would be the majority, are simply influenced by the spin and flow with the tide of public opinion—itself driven by ill-informed Network chatter. The rest have only self-interest at heart—theirs. For many it’s survival. For others it’s simple greed. It’s at this point that we must ask ourselves where it is that we are headed. Are we doomed or is there hope? The Algorithms are of no help. Fed by the TrackingData they simply exacerbate the problem and widen the chasm of misunderstanding—much as Barbie Dolls and photogenic models present a distorted view of reality for teens. The Outlanders and Strangers lack the influence with each other—a factor that is leveraged by those who would twist and distort reality for short-term gain. It is only the Connected in whom there is hope. However before they can influence they must connect. Not with themselves, clearly, but with other humans—irrespective of the apparent alien nature. This is where restricted code comes into play and where we need to go back and look at some of the less-palatable elements of Bernstein’s early work and re-visit the apparent logic flaw in the class distinction arguments. Yes, certainly, there are many who bury their heads in the sand and prefer not to discuss reality—escaping into the virtual world and wearing their cloak with pride. Unfortunately, there are others who are even less connected. There are those for whom reality is hidden by the arcane language and tautology of the spinmeisters. Whatever the motivation or, for that matter, ignorance, there can be no change unless and until there is acknowledgement, communication, and action—and soon. Without change we are heading for a massive socio-economic collapse that is inevitable without systemic change and real reform. It is critical that such change be based upon a solid asset base rather than speculation, the manipulation of financial systems, and paper profits that are ephemeral for all but the tiny, and shrinking, minority. This has nothing to do with Socialism, nor the great late-2011 misnomer—‘the 99%.’ It has everything to do with Capitalism—the only socio-economic system that meshes with human nature. The obvious benefit of removing the restricted code is to communicate that capitalism, this would be sustainable capitalism, is the only system that works on the scale essential for human survival. If we return to Locke, Smith, and even as recently as the early 20th Century and Keynes, we see that only through conservation of commodities and the removal of the arbitrage and manipulation as a valuation mechanism, then apply production to create products that people need and at a price that they can afford, can any determination of value matched with need be sustainable. Explaining this to the inhabitants of the Network is the problem that we face. However, it is the very communication of this explanation that provides the hope. A necessary prerequisite for this cross-species communication is to acknowledge that there is a problem—current and growing rapidly. In particular it is essential for the Connected, the Outlanders, and the Strangers, to acknowledge the truism that the Network is used to manipulate political and economic debate to the exclusion of reality. Before we can move forward we must acknowledge that, more often than not, the Network is used to propagate untruths and outright lies to the extent that they become the accepted wisdom of the age, supported by the patina of orthodoxy. It is only in this way that the growing inequality of the system, with an ever-expanding delta between the haves and the have-nots, in turn ensuring the destruction of the middle class and wreaking havoc, can be reversed. Unless we pause, consider, and make changes, such destruction is inevitable. History shows that as a species we have pulled back from socio-economic apocalypse many times in the past. Too often via violent revolution on the social equality side and when driven by the oppressed. Sometimes we have bridged the chasm through economic and legislative means as the upper classes, the wealthy, and the powerful awoke up to the risks of rebellion. In prior examples where civil insurrection was avoided, usually at the last minute, there was a soft revolution initiated by those enlightened few at the top who understood the dangers and acted in time to put the genie back in the bottle. Although the Network offers hope, the very speed of the medium does not operate to humanity’s advantage. Yes, the Network provides the means to break down the barriers that make sub-sets of humanity alien to each other and restrict the power of the TrackingData and Algorithms, although achieving this goal without regulation that will, itself, lead to division and discord, is a challenge. The trick is to create a cohesive whole through identifying individuals in each discrete cohort of the Connected who are able to link up physically with Outlanders, and then Strangers. Creating such physical interactions where empathic understanding can come into play, then apply the economy of restricted code with the communicative impact of elaborated code, is the only way to transcend the virtual and accept reality. Re-building direct connections is the only way to avoid unintended consequences such as those, for example, that are surfacing as a result of the Arab Spring—an event that, itself, was guided by the invisible hand and built upon virtual interactions. For this to happen, people must meet. People must reach out. Human ‘aliens’ must communicate and strive for understanding of the digital aliens in their midst. There is time. It is running short. It requires action—and now. There is hope. It is tenuous. Merton, Robert K. (1936). The Unanticipated Consequences of Purposive Social Action. With a physics and economics educational background, Colin is an experienced business leader, publisher, speaker, and author. 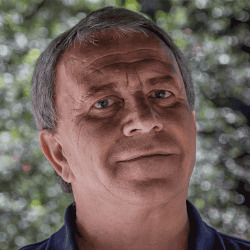 As a commercially focused technologist he developed core components of the digital publishing revolution in the late 70’s and early 80’s, founded one of the first consumer-focused Internet Service Providers in the early 90’s, and built one of the leading Content Marketing publishers to survive the ‘dot bomb’. Having served, or serving, on public and private company boards in the Internet, technology, finance, publishing, and biotechnology sectors Colin provides start-up teams with mentorship and future-vision advice. In addition he writes—primarily children’s fiction—thinks, travels, and activates at the intersection of social equity and capitalism. Bronze, entitled "Profile" / "Profiel" in Dutch. A line of sight, in which all the senses - hearing, sight, smell, taste and touch - come together. A profile is therefore the antenna of feeling and as such also the most characteristic part of our personality. All organs of sense laced as a string of beads, gathered it is the unique human profile. Available in: various height / up to 800 cm.